People either do not know about the Silent Solution system or do not understand how it works. A national campaign to raise awareness of a system to help people in imminent danger but unable to speak to alert police has been launched by the Independent Office for Police Conduct (IOPC). 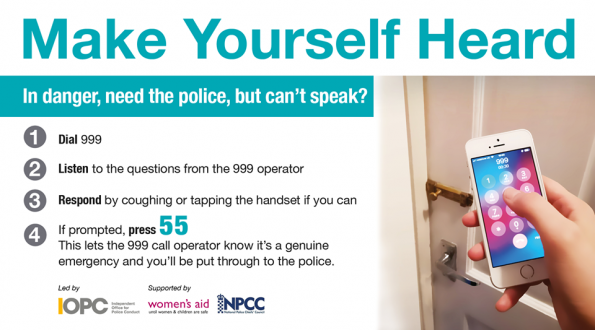 Known as the Silent Solution system, it enables a mobile phone user who is too scared to make a noise or speak when they have called 999 to press 55 when prompted by the operator – which informs police they are facing a genuine emergency. Although the system is well-established in the UK there have been concerns that the public either do not know about it or not understand how it works. Police will not automatically attend if you make a silent 999 call. If you have called 999 you need to listen and respond to the questions and instructions from the operator, by coughing or tapping the handset if possible, or once prompted by the automated Silent Solution system, pressing 55. Around 50 emergency calls from mobiles a day are transferred by a BT operator to police forces in the UK as a result of someone having pressed 55 when prompted, enabling the police to respond. This ‘Make Yourself Heard’ campaign has been launched at the start of National Stalking Awareness Week, which runs from 8-12 April, with support from Women’s Aid and Welsh Women’s Aid, the National Police Chiefs’ Council and the family of murder victim Kerry Power. Kerry Power had believed that if she made a silent 999 call she would not need to speak or make a noise for police to send assistance. Her call was terminated, not put through to the police control room, because she did not know how to use the Silent Solution system. Kerry Power made her silent emergency 999 call in the early hours of 14 December 2013 when her ex-partner, who had been stalking her, broke into her home. She did not respond to the operator and her call was transferred to the Silent Solution system. But as 55 was not pressed, the call was terminated. The ex-partner, David Wilder, called the police later to tell them he had fatally strangled her. An IOPC investigation could not conclusively identify the wording the police officer she had spoken to had used when advising Kerry about making an emergency call, however it was clear she did not know she would need to press 55 when prompted by the Silent Solution system. The Independent Office for Police Conduct replaced the Independent Police Complaints Commission in 2018. Remarking on the ‘Make Yourself Heard’ campaign, the Independent Office for Police Conduct’s Regional Director, Catrin Evans, said: “It is always best to actually speak to a police call handler if you can, even if by whispering, but if you are putting yourself or someone else in danger by making a sound, there is something you can do. “Make yourself heard by coughing, tapping the handset or, once prompted by the automated system, by pressing 55.